This network includes creative spaces in the Greater Wellington region and meets every six weeks to share resources, information and ideas. 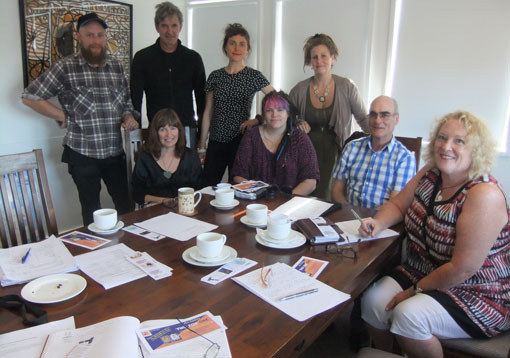 Members include Mix and Arts on High (Lower Hutt); Vincents Art Workshop, Pablos Art Studios and Alpha Art Studios (Wellington city); and King Street Artworks (Masterton). Arts Access Aotearoa co-ordinates the network. If you are interested in finding more about this network, contact Claire Noble at Arts Access Aotearoa (T: 04 802 4349 E: claire.noble@artsaccess.org.nz). Do you want to see an outstanding disabled artist recognised? Or how about a creative space or community arts partnership? Nominations to this year’s Arts Access Awards, presented annually by Arts Access Aotearoa, close on Friday 2 March 2015. Self-nominations are welcomed. Richard Benge, Executive Director of Arts Access Aotearoa, says the Arts Access Awards play an important role in profiling excellence and leadership in the arts and disability sectors. “The nomination process is a great opportunity for people to play their part in recognising New Zealand’s leaders of access to the arts – often the unsung heroes of society who make a real difference,” he says. Arts Access Creative New Zealand Arts For All Award, recognising a performing arts company, festival, venue, producer, gallery or museum that best demonstrates its commitment to developing its audiences by becoming more accessible to disabled and Deaf people. Arts Access Corrections Leadership Award, recognising the outstanding contribution of a New Zealand prison using the arts as a tool to support the rehabilitation of offenders or their reintegration into the community on release. Each of the six awards has a nomination form. You are able to nominate yourself or others. For more information and nomination forms, please visit this webpage or contact Claire Noble at Arts Access Aotearoa (T: 04 802 4349 E: claire.noble@artsaccess.org.nz). Also read the blog by Jules Hunt, Team Leader, Arts on High (formerly Dudley Arthouse), about the benefits receiving the Arts Access Creative Space Award 2014. For the two Arts Access Corrections Awards, contact Jacqui Moyes, Prison Arts Advisor, Arts Access Aotearoa (T: 04 802 4349 E: jacqui.moyes@artsaccess.org.nz) for more information or nomination forms. Nominations close at 5pm on Friday 2 March 2015. Creative spaces often have limited resources and welcome donations of materials such as paint, paper, wool and cardboard. In fact, the possibilities are endless: most creative spaces are expert at recycling . If you would like to make a donation, please contact a creative space or Claire Noble. Arts Access Aotearoa profiles creative spaces and artists throughout New Zealand. If you would like your creative space and artists profiled on our website, please email us. Here is an example of a creative space profile. "If someone wants to do something we'll figure a way to do it," says Harry Watson, one of the art tutors at King Street Artworks in Masterton. "It's driven by the artists." Read more. Here is two examples of profiles of artists working from a creative space. “Art comes from the heart. Don’t be afraid to express yourself.” This is the mantra of Colin Korovin, an artist whose work contains strong, recurrent themes of peace, hope, respect, trust and love. Read more. Daniel Phillips, an artist at the Mix art studio and gallery in Lower Hutt, loves the idea of travelling as much as he likes to paint. Read more. Arts Access Aotearoa writes news stories and post these on our website and, sometimes, on The Big Idea website. We also provide links to these stories on Facebook and Twitter. Please contact Iona with your newsworthy stories. Original generation time 1.3934 seconds. Cache Loaded in: 0.0005 seconds.